We all want to protect ourselves and our families. That is the reason we carry firearms on our person whenever we leave the house. Some of us even carry firearms inside our home, or have firearms tactically staged inside our homes to be better prepared if someone breaks into the home. But as we know, caring a firearm or having one staged inside your home, is a reactionary defense to danger. We must have clear, articulable facts that we were in fear of death or serious body injury before using our firearm for protection. What if we could do things around our home, to better deter criminals from choosing our family or home as a target? We absolutely can. Crime Prevention Through Environmental Design (CPTED) is a multidisciplinary approach to deterring crime from even happening. CPTED is used when developing neighborhoods and can be used in developed, high-crime areas to further other efforts to reduce criminal activity. CPTED was used extensively by my former police department in the crime riddled, apartment dense areas. It was shown to be a valuable component to a comprehensive approach for making the neighborhood safer. There are four main principles of a basic CPTED practice. You can use these components to analyze potential weaknesses and bolster them to increase the safety of your home. These techniques and ideas, can, and should be discussed with your neighbors. More buy-in from the members of the community, creates an even stronger and safer environment for everyone. Natural Surveillance – Ensure your home is sufficiently lit and natural hiding spots are not created by overgrown or extremely dense landscaping. Criminals do not want to be seen by you, or your neighbors. Installing exterior lighting, either motion sensing lights or lights that come on at dusk is one of the biggest bang for your buck when it comes to deterring criminals from targeting your home. Dark areas around your house allow criminals to feel comfortable and operate without fear of being discovered. There are different exterior lights available, such as hard-wired, motion sensor lights and solar powered motion sensor lights. There are also inexpensive timers that you can use to replace your light switch, that allow your exterior lights to automatically come on at a designated time. These devices automate the process and can ensure that you don’t forget to turn the light on or off. Trimming back overgrown foliage and landscaping will ensure that criminals do not have natural cover when targeting your home. Areas around windows should not be completely covered by plants, and ensure your landscaping has not blocked any exterior lights you do have around your home. Natural Access Control – This is mostly geared toward commercial buildings or apartment complexes, and deals with creating a well defined entry and exit to and from the building, while using landscaping and physical barriers to deter people from accessing certain areas of the property. But, there are some applications of improved natural access control that the personal homeowner can apply. Fencing is an obvious deterrent and physical barrier to access. Even if it is not extremely high, anything that makes getting into or out of your property more difficult is likely to help. Territorial Reinforcement – Once again, this is used largely where residential areas are adjacent to commercial ones. The concept is that the residential area should be clearly defined from the commercial area, either through cohesive visual planning or physical barrier. This will make it harder for criminals to blend in with the residents of an area, by being mistaken for someone visiting the commercial area. It may seem normal to see people hanging out in front of a store, but if that store is next to your home, it is difficult to differentiate between legitimate store patrons or someone casing your home. If your property is adjacent to commercial property, it will help expose suspicious behavior by creating a physical barrier to clearly define your property. Maintenance – This is a huge part of CPTED and overall visual deterrence. In 1982, a paper was published describing a theory about why there is crime in rundown areas of the city. This theory was called the “Broken Window Theory.” The idea is that in areas where minor crimes such as vandalism, littering, and general petty lawlessness were accepted, criminals felt more comfortable committing larger crimes. So, maintaining your property, lighting and appearance shows criminals that “you care” about your property. 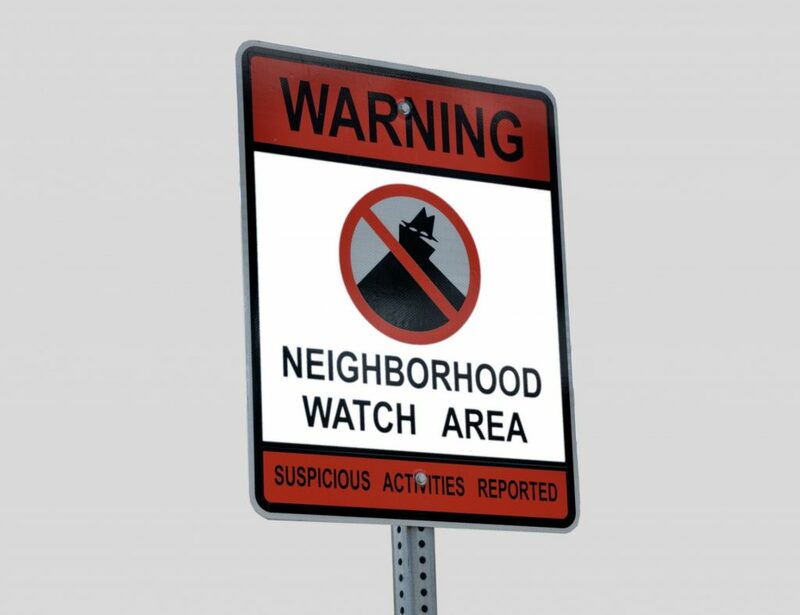 People who care about their property and neighborhood, are more likely to have alarm systems or look out for one another, and notify law enforcement if something doesn't seem right. Practice and implement the principles of CPTED because they are great for reducing the appeal of your home to criminals. But, while we are at it, I want to mention a couple of other things that you should be doing in addition to the aforementioned practices. If you park your vehicle outside your garage, always lock the doors no matter what time of day or night. Most modern vehicles have built in garage door openers or you may have a garage door remote inside your vehicle. Leaving your door unlocked is giving easy access to the inside of your vehicle, and thus allowing access to your garage, and your home. Do not leave anything of value in plain site within your vehicle. Electronics, purses, bags during the Christmas shopping season, brief cases, backpacks…the list goes on and on. All of these things act like a light to a moth, and draw criminals to your vehicle. And please DO NOT leave your firearm in your vehicle at night. If someone breaks your window and gets a handful of change, so be it, but please do not allow criminals to get easy access to firearms. Keep ground floor windows closed and locked at night, no matter what. This is such a no-brainer, but can provide the easiest access to criminals. If you must have a ground floor window open at night, install a quick locking mechanism that allows the window to be opened only so far, and not large enough for a human to climb through. Note: if you use these devices be aware and adjust your fire evacuation plan as you may not be able to easily use that window as an escape point. Keep your doors locked at all times and do not open them to anyone you do not know. 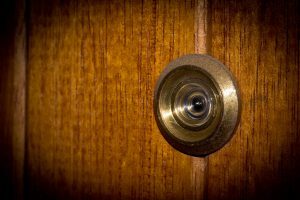 Install peepholes so that you can observe anyone at your door. Replace any standard size screws holding the strike plate of your door with screws at least 2 1/2″ in length. These screws will pass into the door frame, all the way into the studs that the door frame is attached to. This creates additional security and strength to your door. I hope these are things you are already doing, and if not, can implement some or all of them to stay safe.